While so many terrible things happen in the world, there is always a need for something more positive. It seems sometimes that no matter how bad the world can get, there is always something truly magical happening – animals and people getting rescued, receiving their second chance in life, even when they least expect it. 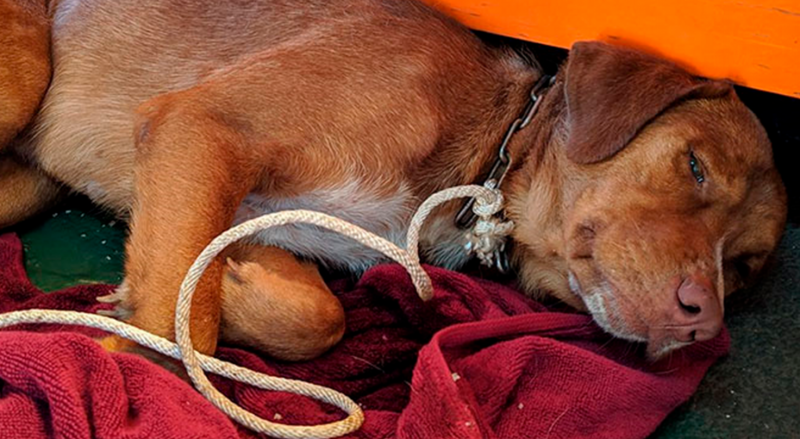 A similar story happened in Thailand, where a poor puppy was swimming 130 miles away from the shore, and when it seemed that everything was lost, men at an oil drilling platform noticed something in the water. One of the employees, Vitisak Payalaw, quickly took his camera and started capturing what he saw. According to Payalaw’s facebook post, they saw his head while the dog was swimming towards their platform. Luckily, it was a rather calm afternoon and the waves were small, otherwise, they wouldn’t have been able to see her. Workers tried to think of ways to rescue him but they were also racing against time since the waves were getting bigger and bigger. They finally decided to tie a rope around her and pull her in. According to Payalaw, when the dog was clinging to the pole but he didn’t make any noise and was absolutely exhausted. She was then taken to vets in Songkhla, southern Thailand where they will do further tests to check if everything is ok with her health. This story, that many call a miracle, quickly spread online and despite many people offering their help, Vitisak has declared he will not be accepting any donations.